National flag. CSW/C-- 2:3 - Different sources differ in the representation of the shape of the trident - possibly it is not entirely defined or it may have changed over the years. All sources seem to agree that the blue shade is lighter then the standard blue used in the UJ (and in the Governor General of Barbados flag) and yellow is in all representation dark, almost orange. [smi80] designate the flag as CSW/CSW, but since BB has no navy and since (as it seems) the white ensign was introduced in the mean time (Naval and Coast Guard Ensign), the usage designation seems to be all right as shown in Album 2000. When I was in Barbados I checked the flag. The blue was uniformly a medium-dark; darker than that usually seen in the French flag, for example, but lighter than that of the US. I'd simply call it B+ in quick descriptions. Likewise the yellow is Y+, rather rich in tone. According to Politikens Flagbook [rya00a] the flag was the winning proposal in a nation-wide contest, and was designed by a Grantley Prescod, teacher of arts. In English heraldry a "barbe" is a trident with barbed points, hence the world's only canting national flag (as far as I know), Barbados. The word "Barbados" comes from Portuguese (or maybe Spanish) meaning "beard [ones]", referring to local mangrove-like sea-side trees. So, as we know, the trident is more recent than the name, and its etymology is convoluted (though not false). A few extra facts were found on this official page. British Standard colour code numbers: "Ultramarine: BCC148, Gold: BS0/002". "His design was chosen from 1,029 entries in an open competition organised by the Government of Barbados. Mr. Prescod was awarded a Gold Medal, an inscribed scroll from the government and $500 which was donated by the Advocate Company Limited. The judges of the competition were Mr. Bruce St. John, Chairman, Major Leonard Banfield, Mr. Maurice Cave, Mr. Neville Connell, Mrs. Enid Lynch and Mrs. B. Ward. Mr. Prescod attended St. Barnabas Boys School. He taught before undertaking a one year course at the West of England College of Art for Specialist Teachers of Art in 1962-63. He also attained a certificate in Education from Bristol University. Between 1967-72 he studied f[or] the Master of Education degree majoring in Art Education at Temple University, Philadelphia, U.S.A.
Mr. Prescod has taught at the Parkinson Secondary School. He served as an Education Officer from September 1977 until he retired in February 1987. Mr. Prescod died on November 12, 2003 at the age of 77." Obituary, photo, and more design details (quote following) at www.islandmix.com. "Prescod did not only win the competition to design the island's symbol of Independence, he actually made the first Barbados flag, after having been sent to Cave Shepherd by then Premier Errol Barrow to choose the lightest of fabrics in the identified colours. In an interview last year, Prescod recalled that he chose "yards and yards and made about seven large flags". A neighbour of his sewed the pieces together." It was announced on 23 of March 2015 that Barbados was to move to become a Republic on the fiftieth anniversary of its independence, 30th November 2016, by its Prime Minister Freundel Stuart. This would also mark the fiftieth anniversary of the flag of Barbados. Becoming a republic would make two flags of Barbados obsolete, these being the Queen's personal flag for Barbados and the Governor General's flag for Barbados. A Presidential flag may be created for Barbados when a republic is declared. A fiftieth anniversary of independence logo has also been designed consisting of a stylized golden fifty with trident over blue script Barbados under which reads Pride and Industry over 1966-2016. For Barbados: PMS 280 blue, 123 yellow and black. The vertical version is simply the flag turned through 90 degrees anti-clockwise. The blue on the left is for the sky, the gold for the sand, the right blue for the sea. The trident in the middle represents the break with England at independence - the trident is broken, thus only the top is showing. The name of Barbados comes from the Portuguese name Os Barbados meaning bearded one, because of the bearded fig tree that used to cover the island. The three points of the trident represent the three principles of democracy - government of, for and by the people. According to Politikens Flagbook [rya00a] (my translation): "Prescod explains the stripes as symbol for the blue sea and the golden sand, that encircle the island. The trident is taken from the previous flag-charge, which showed Britannia holding a trident (symbol for her rule over the seas). Here, the trident is without shaft as a symbol for the break with the colonial past. Simultaneously it symbolizes the sea god Neptune and reflects the sea's large significance for Barbados." The National Flag should be flown every day from the Public Buildings, Trafalgar Square, from 6:00am to 6:00pm. It may also be flown daily from government buildings and schools when they are in session, and places of business. The National Flag should not be flown after 6:00pm except inside a building. The National Flag is flown at half-mast in mourning. The decision on the occasions on which the flag should be flown at half-mast rest with the Cabinet (Government). The flag should never be flown with the trident inverted except as a sign of distress. The flag when on display should not be allowed to touch anything beneath it - floors, furniture, trees, plants, buildings, vehicles, water, etc. When reporting BB stamps with flags, Ron Lahav mentioned a Barbados flag with horizontal rather than vertical stripes, which is shown in stamp SG 677, issued in 1981 for the Carifesta (Caribbean Festival of Arts), Barbados. I cannot swear that the thing in the middle of this blue-yellow-blue horizontal equal triband is a black trident, but there's something there alright. The Government of Barbados Information Service does proclaim that it is the Barbados flag at www.barbados.gov.bb. This is not correct. There is no Horizontal variant. This layout is used in banners at parades and to decorate buildings on Independence day. It represents the national colours but is not a flag. It is never used as a flag. The image on the stamp must be an art error, or it was a special event banner on that occasion. According to this WMO page, Barbados uses signals 45a and 41a: 45a, a green flag, is defined as "The island is out of danger. The green flag of the day signal has a white diagonal stripe" which really means that the 45a picture does not apply to Barbados, as it is incomplete. 41a is the well-known set of two black flags pierced red, meaning "Hurricane conditions are expected within 24 hours." 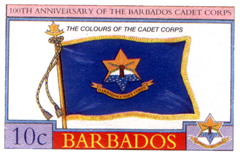 The 100th anniversary of Barbados Cadet Corps was commemorate with a series of stamps, one of which show its flag. "The Cadet Banner features the Corps Crest worn on the headdress of the Cadet Corps members. The Crest, which is blue and gold, is set on a blue background. Over the years the Cadet Crest has been in the form of the Star of David. The centre design of the Crest has been altered each time there has been a change within the structure of the military in Barbados. For instance, in the days of the Barbados Regiment, the Crest showed the Queen with the Trident in hand. The current Crest shows the hand holding two pieces of sugar cane which is part of the Coat of Arms of Barbados. This Banner was established within the early 1980s after the establishment of the Barbados Defence Force. I feel bound to point out that the lady brandishing the trident in the erstwhile colonial badge of Barbados was, in fact, Britannia.